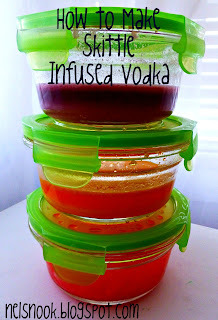 The other day some friends gave me a jar of their homemade Skittle-infused vodka and after trying it I immediately added it to my list of things to make! While cruising the candy aisle at the store partner-in-crime and I were rattling off other candy that might make tasty vodka and being two of the most indecisive people you will ever meet we decided to experiment with 3 different candies - regular Skittles, Sour Skittles, and Swedish Fish. 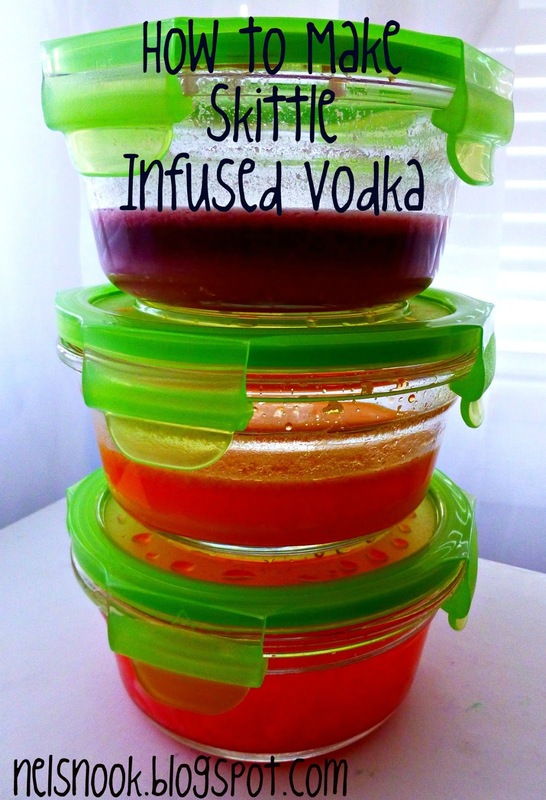 Measure your skittles and pour them in a jar - you will want 1/2 oz of Skittles for every 2 oz of vodka. I just used a shot glass and filled it half way with the Skittles and then 2 shots of vodka or if you are using measuring cups its 1/4 cup of skittles for every 1 cup of vodka. 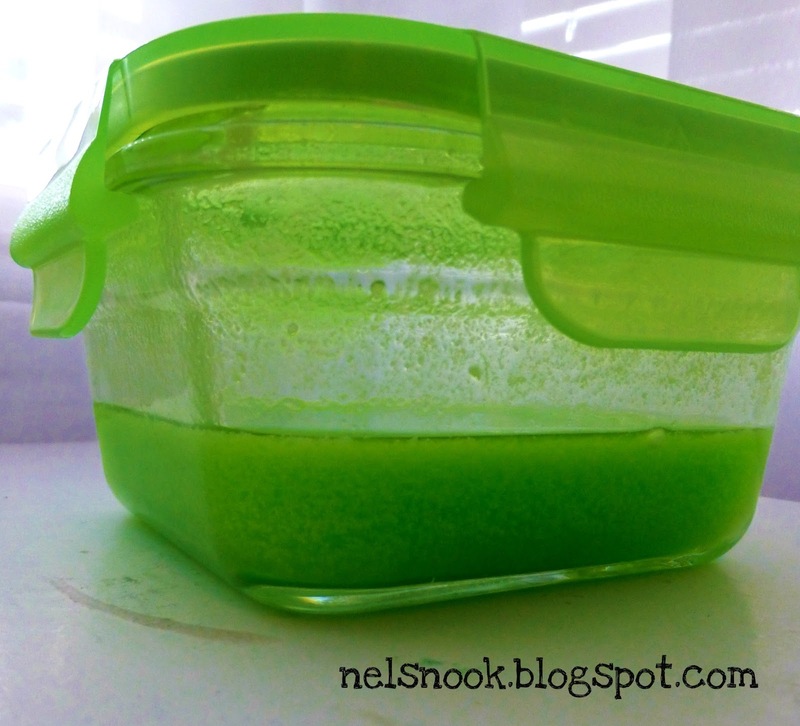 Wait for the Skittles to dissolve - shaking the jar every couple of hours. It takes about a day for the Skittles to fully dissolve - some colors will take a little bit longer. Once the Skittles have dissolved, strain the vodka through a coffee filter - this step seems odd but its necessary to avoid little white specks floating in your drink. Return the strained vodka back to a sealable container. Enjoy with your favorite mixers - here are some mixed drink ideas! * The ratio of candy to vodka really depends on personal preference. I tried a few different combinations and decided that 1/2 oz of candy per 2 oz of vodka tasted the best - not too subtle not to sweet. I recommend starting off with a small batch of each flavor and then once you know your favorite(s) make bigger batches. Sour Skittles - I used the same directions as above. They have a little bit of a sour kick to it and people really enjoyed them. This picture was taken before the vodka was filtered - filtering it really makes a difference! 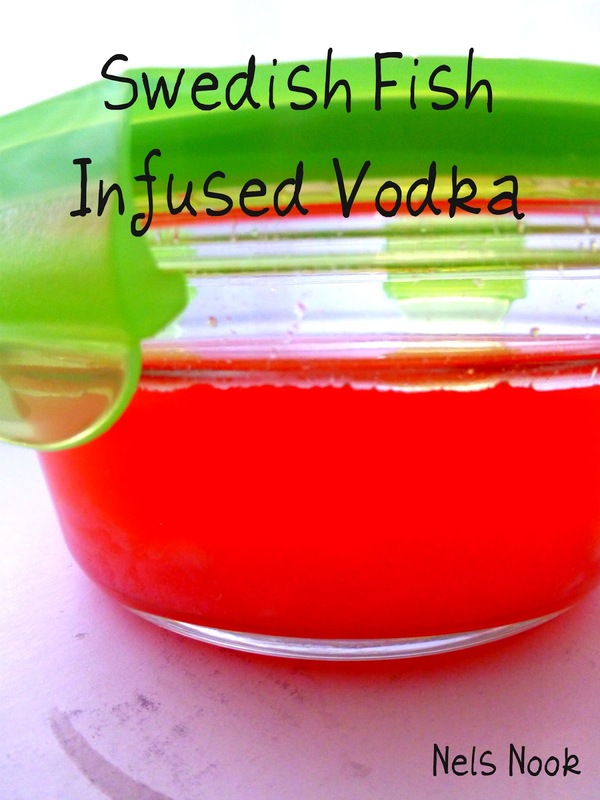 Swedish Fish - Again, I used the same directions as above but they are a little harder to measure - I used a 1/3 cup measuring cup for every 8 ounces of vodka*. 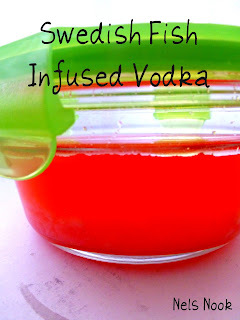 The Swedish Fish take a lot longer to dissolve and need more straining but the result is pretty yummy! Note - if you are making red Skittle vodka and Swedish Fish vodka at the same time make sure you label them - they look identical! Have you tried candy-infused vodka before? Leave a comment and let me know what your favorite kind is!